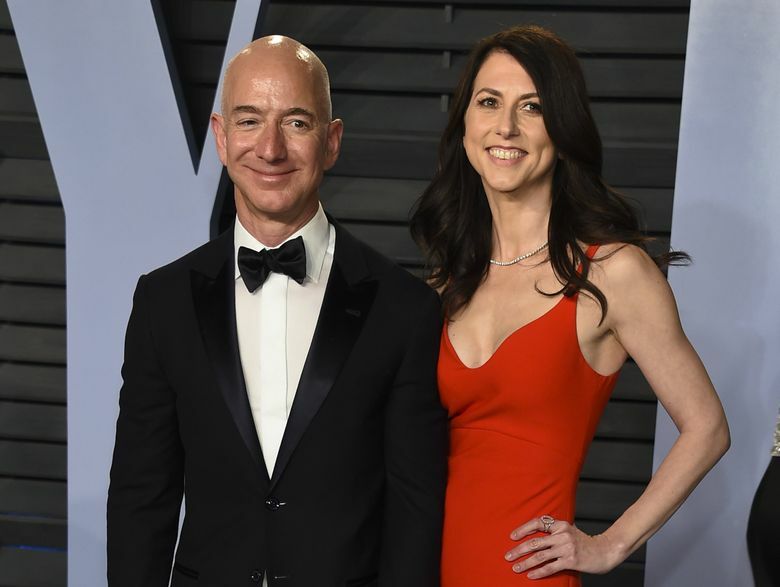 Jeff and MacKenzie Bezos said Wednesday they are amicably ending their 25-year marriage, a startling announcement with implications for control of Amazon, the retail and technology titan that grew to dominance during their quarter-century partnership. The divorce, as presented by the Bezoses, appears to be orderly and not in dispute, reducing the uncertainty around Jeff Bezos’ ownership stake in the company he founded two years after marrying MacKenzie. But the governing laws of Washington state — the likely venue for the divorce — would require a just and equitable division of assets, presumably including the Amazon shares that make up Jeff Bezos’ world-leading $137 billion wealth. That could effectively end Bezos’ run as the world’s richest person while also elevating MacKenzie Bezos individually into the ranks of the wealthiest. Several news outlets, including Page Six and TMZ, reported Wednesday that Jeff Bezos has been seeing Lauren Sanchez, a former television anchor and pilot. The relationship reportedly began after the Bezoses were separated, the outlets reported, citing sources close to Sanchez. The National Enquirer reported Wednesday that a special edition, out Thursday, would reveal details of the relationship. The principal source of Bezos’ wealth is his ownership position in Amazon. He held about 16.1 percent of the company as of Nov. 28. The next four largest holders are The Vanguard Group (6.1 percent), BlackRock (5.2 percent), FMR (3.5 percent) and State Street Global Advisors (3.2 percent), all as of Sept. 30. In its 2018 proxy statement, Amazon noted as a preface to its list of major share owners, that the named individuals have sole voting and investment power “subject to any interests of the reporting person’s spouse” — a typical disclosure. “I’m assuming that a large part of the brain power that went into this divorce was how to make sure that Jeff Bezos remains the controlling shareholder at Amazon,” said David Starks, a family law attorney in Seattle with McKinley Irvin. If the venue of the divorce is Washington state — a fair assumption given that this is where the Bezoses’ minor children live — and barring the presence of a pre- or postnuptial agreement, the assets acquired since the couple married, including the Amazon stock, would be subject to “just and equitable division” between the parties, usually meaning a 50-50 split, Starks said. That’s because Washington is a community property state. Starks said he would be surprised if there was a prenuptial agreement between Jeff and MacKenzie Bezos, noting that such agreements are rare — even most divorce lawyers don’t have them, he said — and the couple met when they were young. “It was a marriage of love and romance,” he said. Prenuptial agreements are much more common in second marriages, he added. Starks, whose practice focuses on high-net-worth individuals, said given that Amazon is one of the world’s most valuable companies and control of it could hang in the balance with the Bezoses divorcing, the couple has almost certainly completed all the necessary agreements to divide the assets in such a way that preserves Jeff Bezos’ control. Such a settlement agreement is unlikely to become public, Starks said. The document is typically incorporated into a judge’s divorce decree but never actually filed with the court, to protect the privacy of the couple. The disposition of Jeff Bezos’ Amazon shares, should a substantial change in ownership occur, would be disclosed in filings with the Securities and Exchange Commission, Starks said. The couple may also choose to describe their plans, given the public interest. Beyond Amazon stock, the Bezoses have a large real estate portfolio. In addition to their Medina residence, the Bezoses own a pair of side-by-side homes in Beverly Hills; a residence, formerly a museum, in the tony Washington D.C. neighborhood of Kalorama (Bezos bought the Washington Post in 2013 for $250 million); and several adjacent units in a New York City building on Central Park West, according to a list The Wall Street Journal compiled. The latter two dwellings are close to the locations Amazon announced in November for its major office expansions. There is also a Texas spread — some 300,000 acres including a ranch that serves as a base for Blue Origin, Bezos’ space exploration venture. Jeff Bezos spent childhood summers on his grandfather’s south Texas ranch. Both Jeff and MacKenzie Bezos attended Princeton University, though they did not overlap there. She studied English under writer Toni Morrison, graduated with top honors in 1992 and went to work at the New York hedge fund D.E. Shaw to pay the bills as she pursued her calling as a writer. Jeff Bezos was a senior vice president and reportedly the first person to interview her there. Her office at the firm was within earshot of Bezos and his famous laugh, according to a 2013 profile of MacKenzie Bezos in Vogue. Jeff Bezos was dating in New York City at the time and sought a match who was resourceful, according to a 1999 Wired profile. “The number-one criterion was that I wanted a woman who could get me out of a Third World prison,” he told the magazine at the time. But the blind dates his friends set him up with went nowhere, according to the account. Instead, Bezos, who was about to be assigned to scouting investment opportunities in the nascent internet, fell in love with MacKenzie Tuttle, a research associate at the firm. They married a year later, in 1993. The couple moved to Seattle in 1994, MacKenzie driving cross-country as Jeff famously wrote the business plan for Amazon on the way. The couple have four children, three boys and a girl, the oldest of whom is about 18. MacKenzie Bezos put her writing on hold when their children were young, and she was the primary caregiver as they reached school age, dropping them off and picking them up in a Honda minivan, Vogue reported. She was intimately involved in the company’s early days. The Wired magazine profile notes that she negotiated Amazon’s first freight contracts. MacKenzie Bezos is the published author of two novels, “The Testing of Luther Albright” and “Traps.” Jeff Bezos was “my best reader,” she told Vogue in 2013, noting that he would read her manuscripts in a single sitting and provide detailed feedback. Jeff Bezos reportedly attended MacKenzie’s reading of “Luther Albright” at Elliott Bay Book Co. in 2005. In addition to her writing, MacKenzie Bezos in 2014 founded an anti-bullying organization called Bystander Revolution. In 2018, Jeff Bezos announced a stepped-up philanthropic profile, saying that he and MacKenzie planned to contribute an initial $2 billion to causes including education and homelessness.